MOSCOW, the Russian Federation, (BulgarianMilitary.com) – Today, the Russian state media reported for an accident that happened early this morning, near the port city of Murmansk, during which the 330 meter – long PD-50 floating dry dock, holding the Russia’s only aircraft carrier Admiral Kuznetsov, sank, while the vessel was undergoing repairs in the region. The accident caused damages to the vessel and injuries to four ship repair plant workers. One person is missing as well, learned BulgarianMilitary.com. At this point, the Admiral Kuznetsov was being overhauled at the 82nd Repair Shipyard in the village of Roslyakovo near Murmansk in order to go back into service in 2021 with the Russian Northern Fleet. When early this morning a power supply disruption and a collapsing of a crane on carrier’s deck led to the submergence of the biggest and only dry dock, where the Northern Fleet can carry out repairs and upgrades of its large naval surface ships and submarines in Russia. The governor of Murmansk, Maria Kovtun, stated that as soon as the floating dock, which at this time the ship was leaving, started to sink, a rescue operation began and 71 people were evacuated. According to the information, reported by the investigators, engaged in the accident’s criminal investigation that was opened, there are four people treated for hypothermia after being saved from the cold waters of the Kola Bay, and one person is still missing. It is yet to be investigated whether the safety rules have been complied. 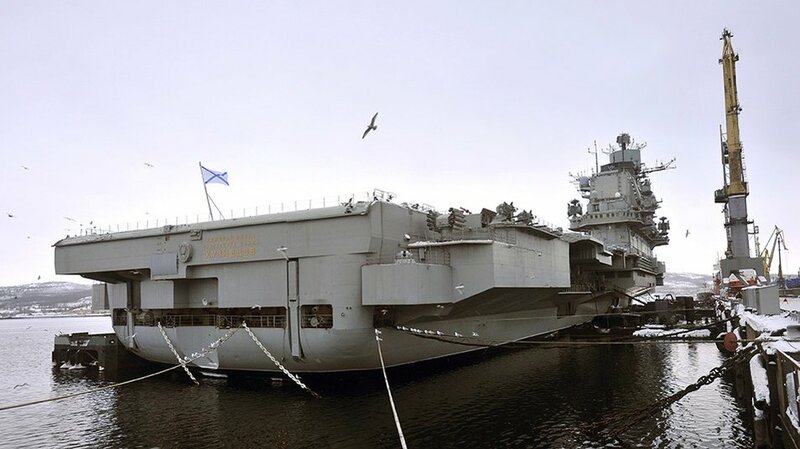 The aircraft carrier was successfully extracted from the dock, before the latter completely submerged, then it was towed to the near Sevmorput Yard No 35, according to Yevgeny Gladyshev, a spokesman for the shipbuilding factory, operating the floating dock. He confirmed that the cause for the accident was the power outage, which struck the floating dock, rapidly filling up its water tanks. The factory cannot specify the amount of the damaged equipment, but it said that at that time much of the deck was in parts because it had been removed during the overhaul. According to another statement, this time made by head of Russia’s United Shipbuilding Corporation, Alexei Rakhmanov, the vessel’s hull and deck were damaged, but the “vitally important parts” weren’t. The 305-meter aircraft carrier Admiral Kuznetsov was deployed in the the Eastern Mediterranean in 2016, by Russia, as a part of its ongoing military campaign to support Syrian government forces with Russian planes, which to carry out air strikes against the rebel forces in the war of the Middle Eastern country.